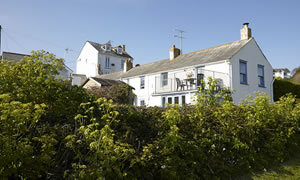 sea retreats in Marazion, West Cornwall. The two cottages are in a prime coastal location offering charming, comfortable accommodation with stunning views of St Michael's Mount. They are available to hire individually (Trevara sleeps 6, Little Trevara sleeps 4) or can be hired together to provide flexible accommodation for up to 10 people, perfect for wedding guests or large family groups. The old market town of Marazion offers many amenities; shops, pubs, restaurants, art galleries, sailing club, watersports, bird watching, and one of the safest sandy beaches in Cornwall - all reached by a 2 minutes walk. It is within easy reach of the large town of Penzance, which has rail links to London and sea and air links to the Scilly Isles. Brought family ranging from 80 year old father to 16 year old daughter. Marvelous walking holiday. Saw seal off point at Minack Theatre, gannets, peregrine falcon, hen harrier plus curlew, oyster catchers etc. All walked coastal paths. Lamorna - Mousehole harder if you're 80 but Porthgwarra - Porthcurno less arduous. Hid in pigsty to escape hailstorm. House and village loved by all. Lovely cottage with such a wonderful view. Great place to stay, warm ambience, comfortable. stunning surroundings. Great base to explore Cornwall, can't wait to come again. Absolutely sensational. Nothing could be more perfect. The cottage, the location, the storm blowing outside. Love it. What a beautiful place tucked right at the end of the country with the most magical views. Impossible not to be happy here. This is an amazing location to relax with your grand facilities. Views to die for, & heavenly peace & quiet. We'll be back. It is such a beautiful cottage with the most extraordinary view I've ever seen in the UK. St Michael's Mount is magical. A truly 'Cornish Cottage' with spectacular views. A very memorable holiday. Thank you. 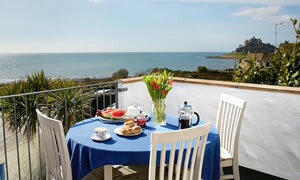 Fabulous location – outstanding views, lovely relaxing week in spacious surroundings. My first time in Cornwall and it has been an absolute pleasure. We have relished coming back to our peaceful home from home every evening and watching the sea and stars by the moonlight. Yet another wonderful week - the sea and sunshine were all the more welcome after a monsoon summer. Our third time in the cottage and it just keeps getting better. We have spent many Christmases in Cornwall but this has been one of the best. A beautiful cottage with fantastic views. Look forward to returning.